Today I was on one of our local news channels for a third time to show off my baking skills. 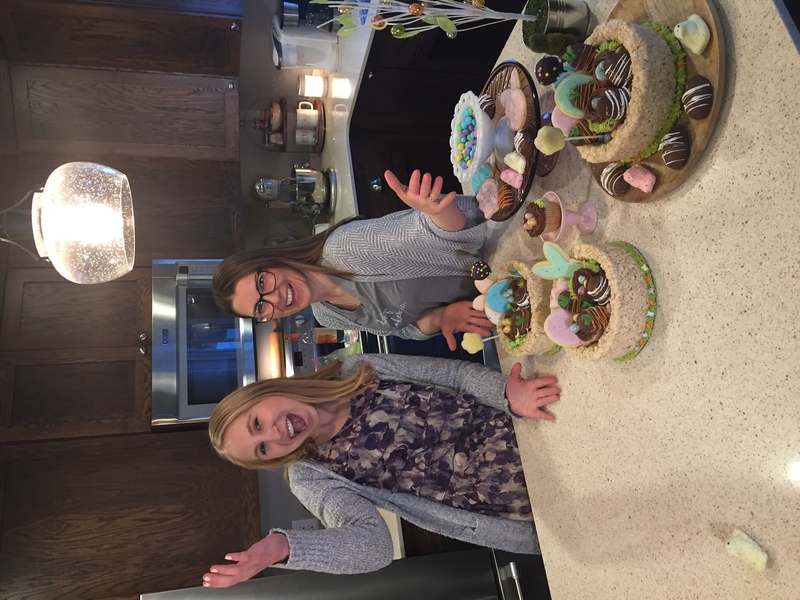 I’ll be honest, when reporter Abby Furchner asked me to be on again to do Easter treats, I was little reluctant because I had no idea what I wanted to do. 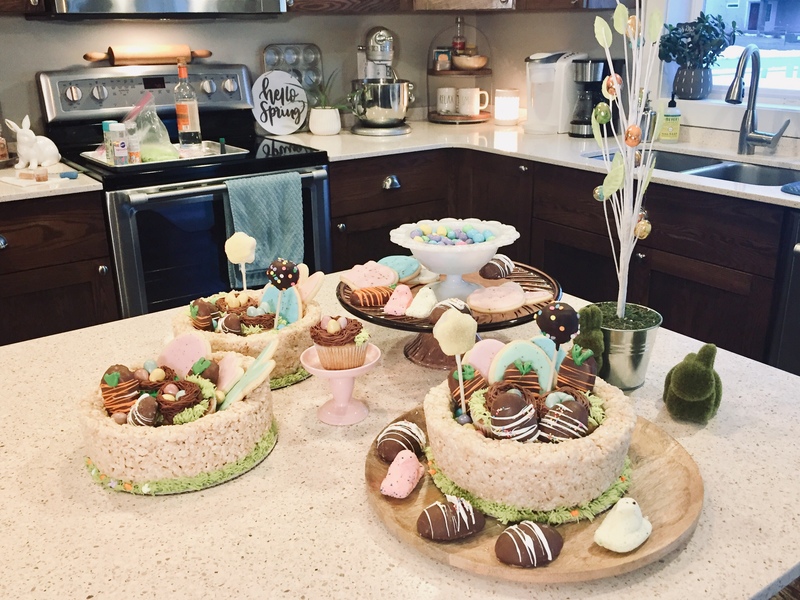 After sleeping on it, the next morning in the shower, I had an idea: EDIBLE EASTER BASKETS! So I immediately (finally) emailed Abby back with my idea and we were on the same page. And I refused to look up ideas on Pinterest before the airing because I wanted it to be fully my own! The most exciting part of the basket (to me) was the base being made out of Rice Krispy treats. Here’s how I did it. Use one recipe of Krispy Treats following the directions straight from the side of the box. Thoroughly butter at 2 1/2 quart baking dish and pour the warm treats inside. 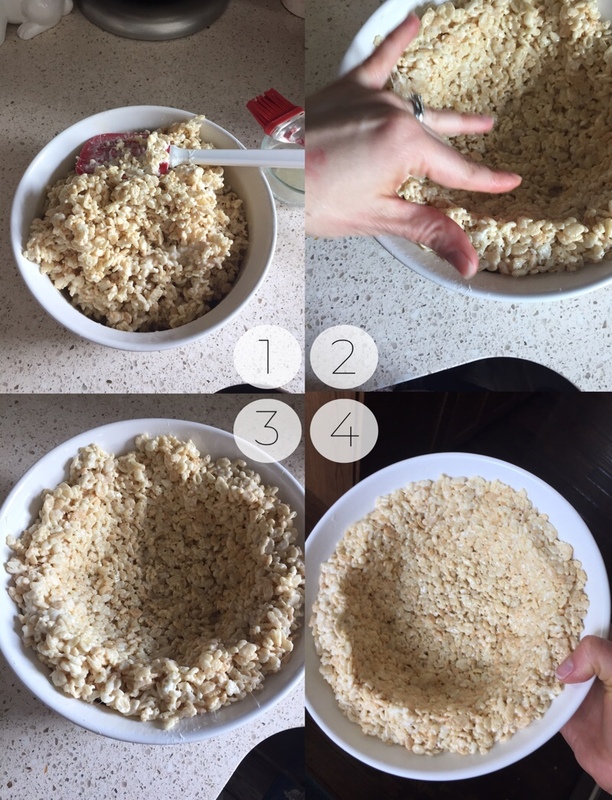 Using slightly wet hands, start to form a well in the center of the rice crispy treats and push the treats towards the base and the sides. Continue pushing the rice crispy treats towards the base and sides until a basket is formed, making sure the top edge is flat and has even thickness. Refrigerate the form or let it sit out to firm up a bit before taking it out of the baking dish. 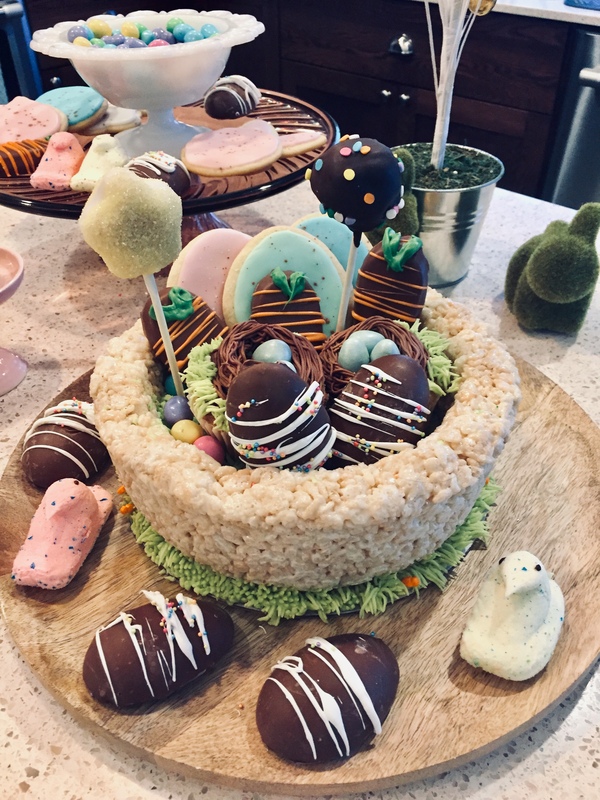 Use a nonstick cake circle to place the basket on and have fun decorating with piped buttercream grass, coconut grass, or sprinkles. Fill the basket with other homemade baked goods and/or store-bought treats. 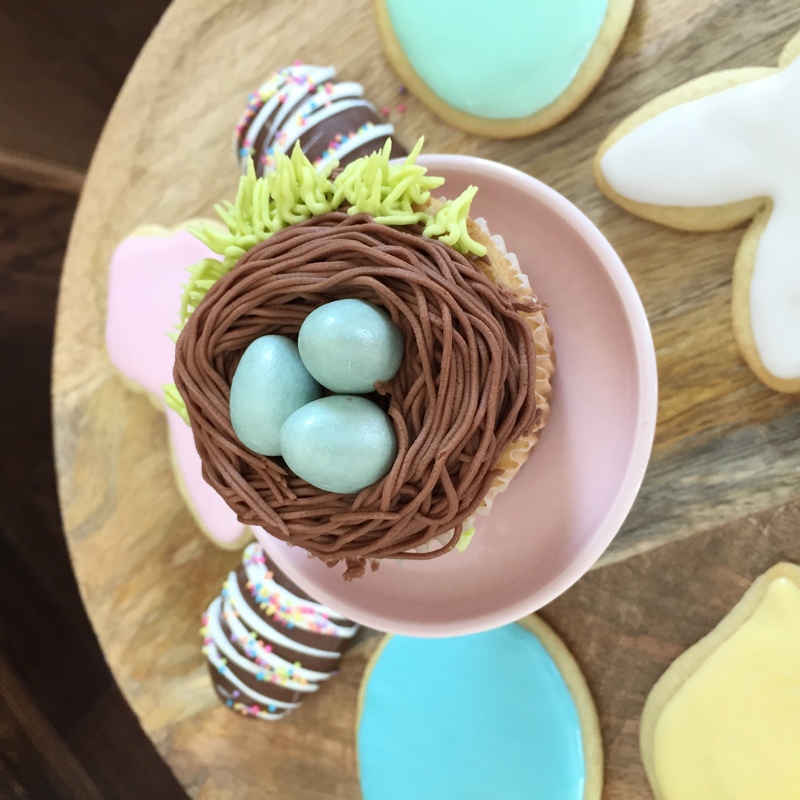 I made nest cupcakes with chocolate buttercream piped with a grass tip and filled them with Mini Cadbury Shimmer eggs. The blue is SOOO pretty! Then I added some frosted, cut, sugar cookies and splattered them (not pictured above, Ha!) with a mixture of shimmer dust and vodka to look like speckled, malted eggs. I also fancied up some store bought candy with drizzled candy melts. 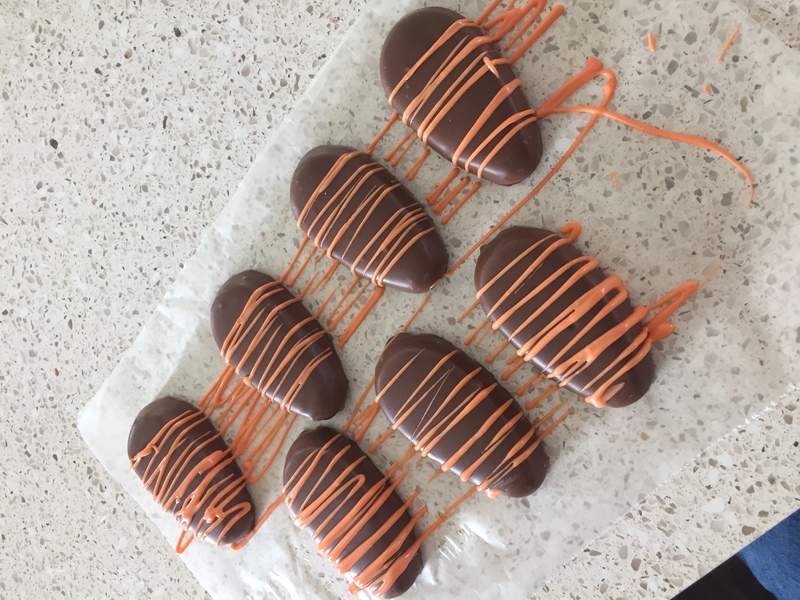 I thought the Recee’s peanut butter eggs looked like carrots so I used orange and green chocolate on those. The Hershey’s chocolate covered marshmallow eggs looked adorable with fun colored sprinkles. Finally, you can dye coconut with green liquid food coloring and fill your basket with all these goodies and more! The cake pops pictured are courtesy of my friend Casey from Love In The Oven Bakery. And there’s your spread! 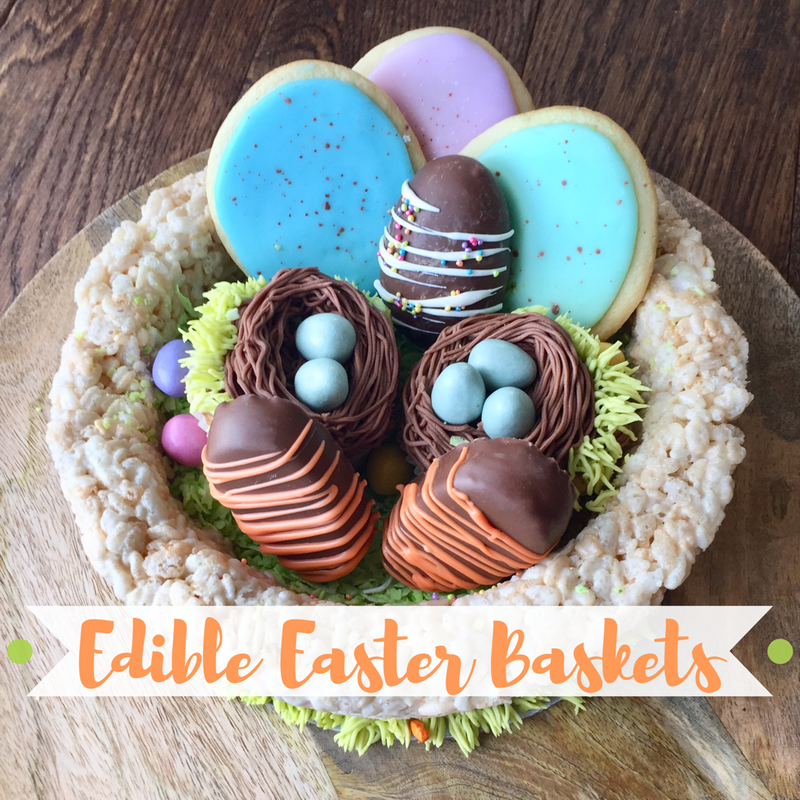 These make great centerpieces for your Easter table, they are perfect for older kids who aren’t so impressed with cheap plastic toys inside a dated basket, or I bet they’d put a smile on a neighbor’s face that might not have a family close by to enjoy this season. When I was 21 in the fall of 2003, I moved from the only home I ever knew in North Carolina all the way to Los Angeles California to go to design school. I didn’t know anyone when I moved there. I started completely from zero. A year later I had made quite a few close friends, had a semi-serious boyfriend with a fancy motorcycle, and a long list of single-twenty-something stories I won’t retell here. Or maybe ever. My experience in California was everything you might think. It was exciting, expensive, beach-y and smoggy, I spent too many long hours in traffic, and had plenty of encounters with celebrities. My boyfriend had a Kawasaki Z1000, an oversized crotch rocket. We would ride with a group of his friends, gather with hundreds of other bikers in random parking lots until police helicopters flew over, and go up to Dodger’s stadium and line the curvy hills to watch other bikers do tricks – think standing on handle bars while doing a wheelies. This was just like what you might see in the first minute and a half of an episode of CSI except it was real life. One night my boyfriend and I were on “the” 101…or maybe it was “the” 10, I don’t recall…but I remember looking down to see 126 mph on the digital speedometer on his bike. I remember how fast the lights flashed by, the deafening sound of the wind through my helmet, and holding on with all my 110 lb might. By the grace of God we stayed on two wheels that night. But that wouldn’t hold true for long. Since my family was clear across the country and I wanted to make the most of my time in California, I decided to stay and do summer school after my first year of interior design. As the end of summer session approached I found myself behind in preparing for my Residential Design Thesis project. I had to buckle down and cram over the long Labor Day weekend. On Monday of Labor Day when I could finally see the light at the end of the tunnel on my project, boyfriend took me out for lunch in West Hollywood and then down to Santa Monica for a short ride on the PCH before heading back to my apartment to finish up my thesis. We were heading eastbound on Sunset Boulevard that afternoon on his bike, with the sun behind us. As we began coming into Hollywood, I remember, seeing a green light ahead, I remember tucking my head on his back, and looking right at the park we were driving past. The next thing I remember was the noise. Tires screeching, a thumping noise, and a quiet rush wind with an obvious void of the hum of a motorcycle. Then my body hit the ground. I was on my stomach facing the direction we had come from, sliding backwards down the road with my arms in front of me. I started to push myself up to stop myself when I saw the motorcycle I had been on just seconds before sliding towards me. I tucked my head and arms into my body. Then everything stopped. I rolled over. I breathed. I laid on my back with a prayer in my head. “Oh God, Oh God, Oh God.” echoed over and over in my helmet. “Can I wiggle my toes?” I thought. I could, but not much else. I lifted my head and looked for boyfriend. I called his name and he answered. We were alive. I could smell the oil and gasoline that was leaking from the chunk of metal that was just above my head. I was missing a shoe and my jeans were shredded, exposing most of my legs. Soon there was a shirtless man standing over me asking if I was ok. His friends were calling 911 he told me. I tried to sit up but my legs felt like jello. So I laid back down. A few minutes passed and then I heard the sirens in the distance. I was alive and they were coming to peel my body from the tar. I didn’t know what happened until the police officer came to the hospital to question me. I thought he just lost control and hit the curb. I didn’t see the Ford Explorer that made a left hand turn in front of us at the light. It turns out, he didn’t see us either. Nor was he going to stop. He drove another block before a passenger he was giving a “Hollywood homes” tour to made him pull over. My left Teva left a blue skid mark on his front bumper just before the foot peg caught the left front headlight and threw everything off balance. I had a shattered left patella, a broken bone in my foot, and road rash covering both arms and legs and part of my side. Boyfriend was going into surgery to save his foot that the motorcycle had mangled when it came back after us. He would end up staying for several days after hours long surgeries. I stayed mostly in a hallway in the crowded ER. I listened to a woman screaming in agony until I had to close my ears and sing to myself. She had been cliff jumping, landed in too shallow water, and had broken both of her legs. A nurse dialed my parents’ long distance number from her cell phone and gave it to me when it started ringing. My mom answered, as usual. “Mom, I’m ok, but I’m in the hospital. I’ve been in an accident.” I can only now begin to imagine what those words must have done to my mother’s heart. After a few x rays, shots, bandages, meds, and a leg brace, I was released later that evening to my roommate and her boyfriend who took me back to the 2 bedroom Hollywood apartment we shared with two more roommates. Although I was fully awake during the entirety of the accident itself, the following days are a blur in my memory. I remember sleeping a lot and hurting every time I breathed. I needed help going to the bathroom because the scabs on my arms and the leg in a brace made it difficult to pull my pants down on my own. But mostly I remember my roommate and close friends who came to care for me and feed me and walk me to the bathroom before my parents made it out to take over. My heart is forever grateful for them. In the fourteen and a half years since the motorcycle accident, I have struggled with my left knee. It never seemed to fully recover. I have a big gash in my left thigh that for a long time looked like a Grateful Dead skull and lightning bolt tattoo. I have often wondered if there was more damage to my quad that was never fully investigated. There are small, dark pieces of asphalt in my knee and thigh and my husband says when I go up stairs my knee makes the same bone grinding sound that happens when you twist the head off a deer after the hunt. Lovely. I’ve come to terms with the scars and have mostly recovered from whatever PTSD I might have suffered. I can pass motorcycles while driving and not flinch anymore. I’ve always loathed running so when my PT told me I will probably never run a marathon I did more of a happy dance than cry a river. BUT if I wear shoes with any kind of heel, or try to go dancing (and I love going dancing), or hiking (I also love hiking) I’ll be icing my knee for a week. Somehow in the fall of 2018 I tore my meniscus. I don’t know how exactly, I just know that one day my knee swelled up and I couldn’t get it to go back down with ice and ibuprofen. An MRI revealed the tear, some other significant degenerative cartilage damage, and the residual arthritis that we knew was under the patella from the motorcycle accident. A cortisone shot helped take the swelling down but the tear needed to be fixed via knee scope. I had my knee scoped on Thursday. 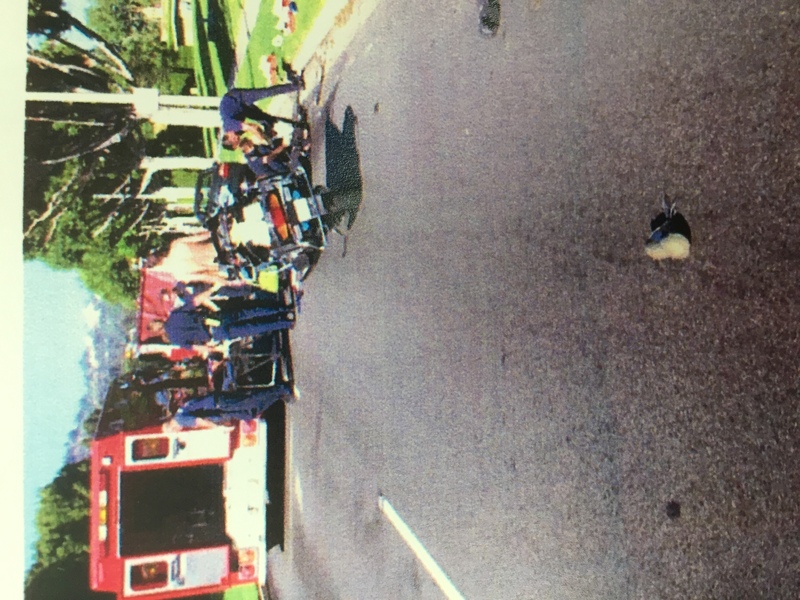 I was nervous – the motorcycle accident had a way of snapping me out of the temporary care-free state I had my first year in Los Angeles and back to the anxiety I’ve otherwise always known – but the procedure went well. I’m in very little pain and I can walk…er, hobble. Hubs is referring to me as The Peg Leg. This recovery, however, has brought up unexpected emotions and is why I decided it was time to finally tell this part of my story. I laid on my bathroom floor this morning doing the prescribed post-surgery exercises, and cried. I cried because fourteen years ago the hand of God came down and stopped a motorcycle before it came for me. I cried because fourteen years ago I lived after being thrown from a motorcycle but four years ago my niece died while buckled in the middle of the backseat of a car. I cried while I lifted my leg 20 inches off the floor and thought of my co-worker’s step daughter who fell from a barn loft and broke her neck and my cousin’s husband who lost his foot while fighting in Iraq; both of whom have fought so much harder and under much worse circumstances to keep going. I cried because I was all together immensely grateful for this life I’ve been granted AND incredibly frustrated by the small inconveniences of every day life from having a bum knee AND feeling really silly for having such strong emotions about something as simple as a knee scope. God help us sensitive types. I know there are big words that describe the somewhat cliche emotions that people like me feel in situations like this, but I don’t think I’m really worthy of them. As author Glennon Doyle says, life is “bruitful” and “we can do hard things.” I believe every story is worth sharing for the simple fact that someone might see themselves in it and know they are not alone in their silly bathroom floor pity parties. Writing is a great form of therapy and it seems I may need a bit of therapy at the moment. Anyway, what I’d like the moral of all of this to be is: whatever your battles are, be they but little, or bigger than a Kawasaki Z1000 flying towards your noggin, keep fighting, friends. Everything…EVERY LAST BIT OF IT, is worth it. 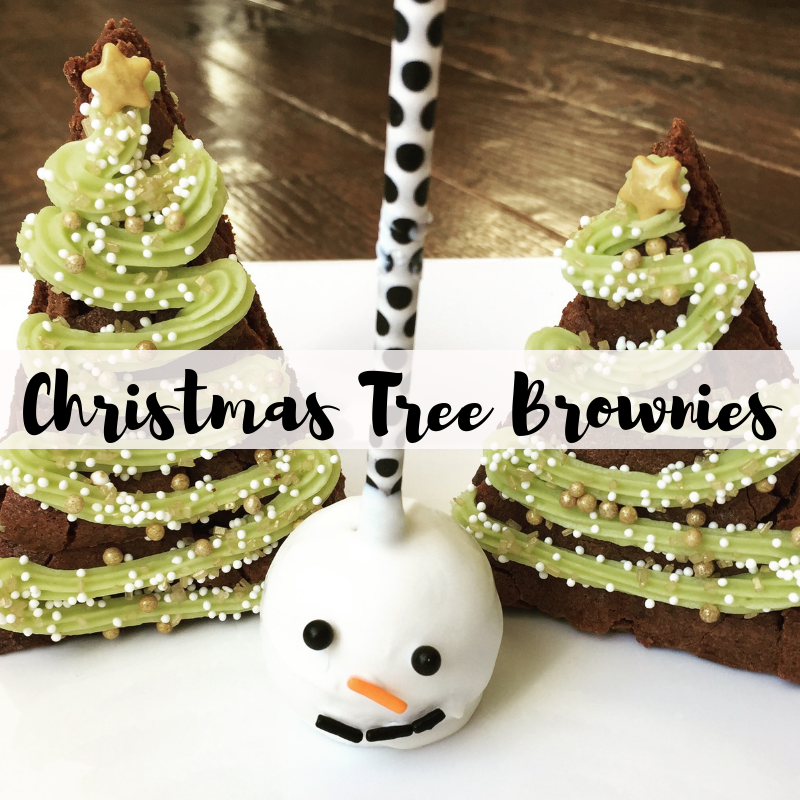 Tomorrow morning Abby Furchner, reporter for Valley Today, will be coming over bright and early again to talk Christmas treats. 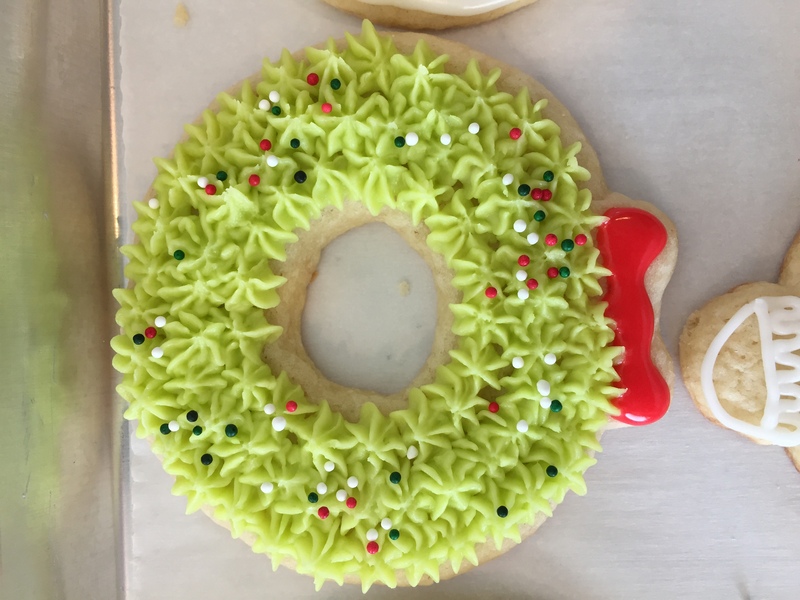 We’ll be decorating three different treats while she’s here and for one of the segments we’re tackling sugar cookies. For a whole 90 seconds! 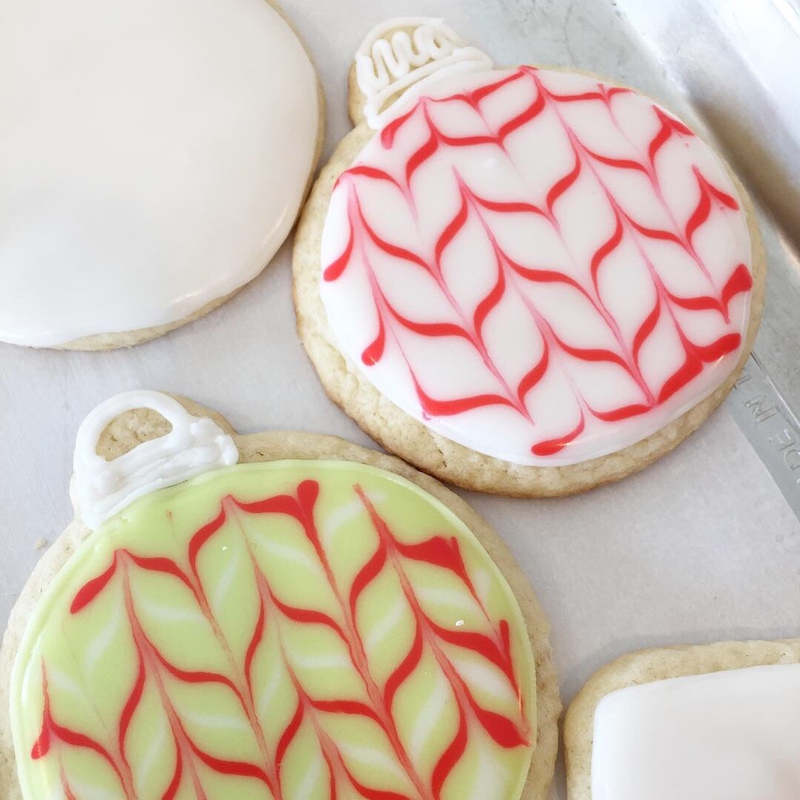 If you’ve ever made cut out sugar cookies you know that’s not enough time to talk about all the details involved in making and decorating those beasts. So I’m dedicating this post to give a few tips I’m sure I won’t have time for, or may forget, tomorrow. 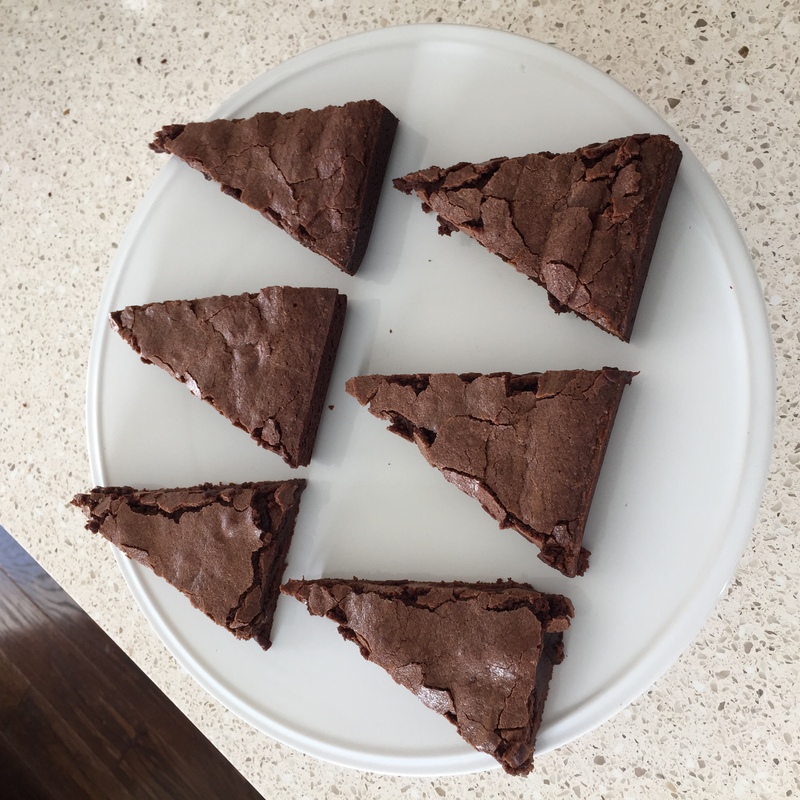 First, make sure your recipe is for cut outs. 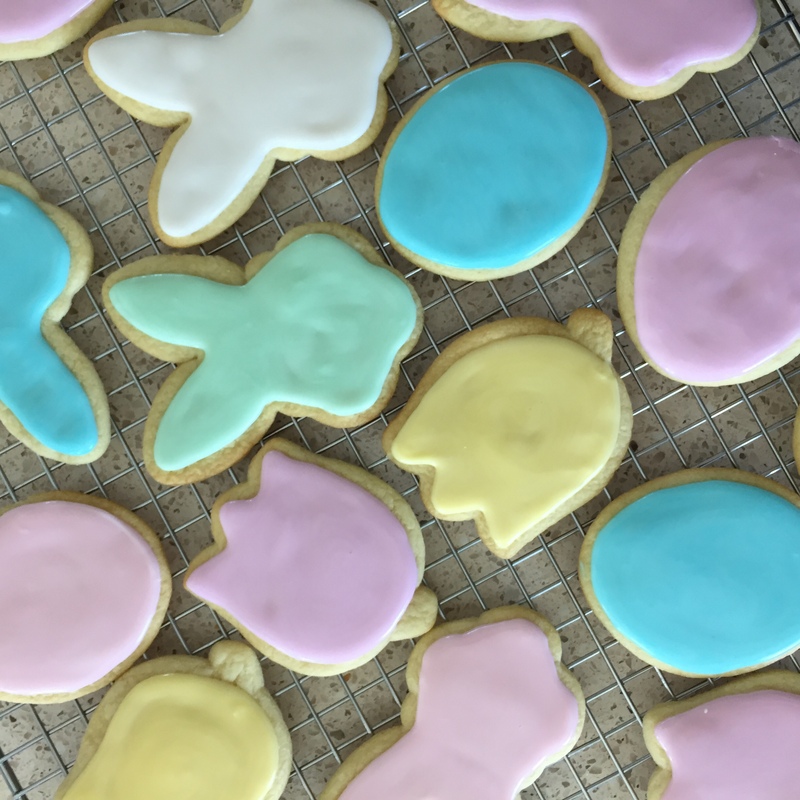 Regular sugar cookies spread which isn’t great for intricate cut outs. Make the dough a day ahead of time. When I make cookies, I plan for a whole weekend dedicated to the task. Dough making happens Friday night then it’s chilled for at least a day until I’m ready to bake. Use powdered sugar instead of flour to roll out the dough. It makes for a sweeter bottom and lessens the chances of the dough getting tough after rolling it out again and again. Keep the rest of the dough cold while you’re not using it. 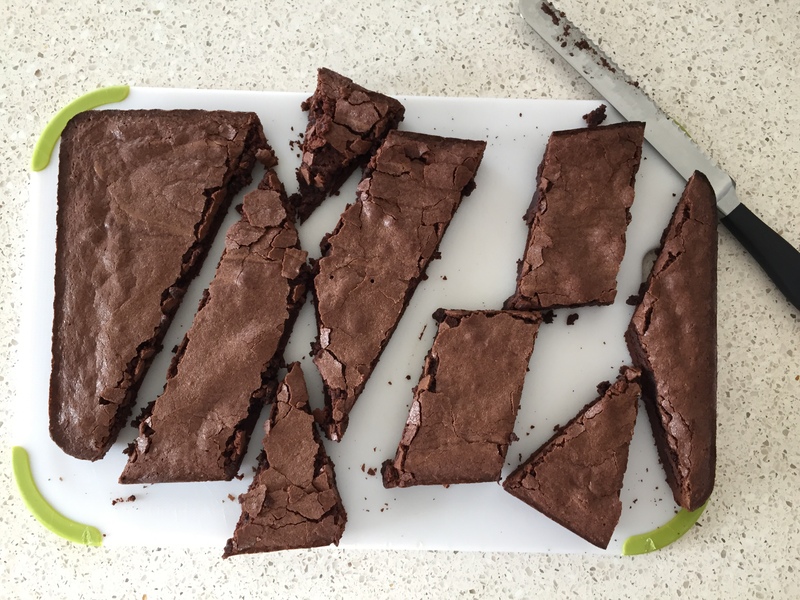 Once cut and on the cookie sheet that’s lined with parchment paper, chill the whole pan in the fridge for a few mins before sticking it in the oven. 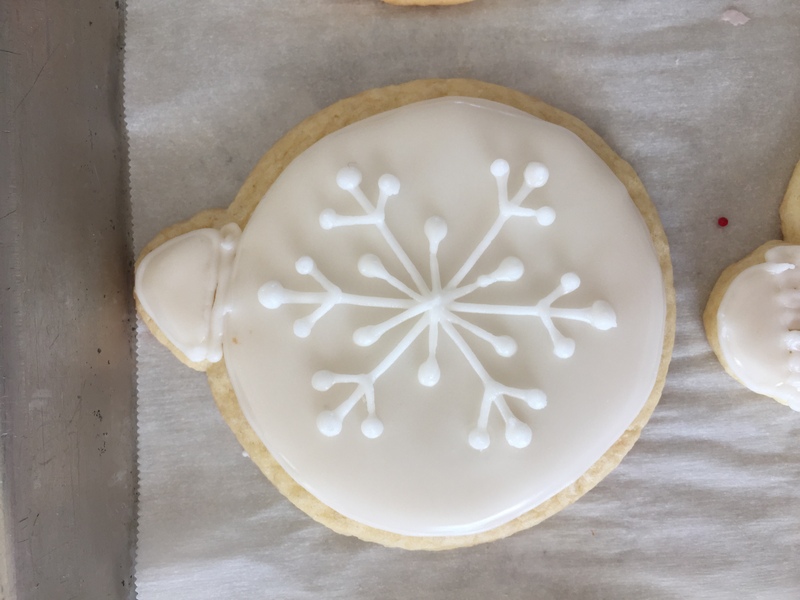 A cold pan and dough will help each cookie hold its shape. Watch the time. Different pans can cook differently. Keep an eye on them. Don’t let them brown. Make sure they’re done, but take them out at the first sight of tanning. (Is that I thing or I did I just make that up??) They will continue to cook on the pan after you take them out. Let them rest on the pan for about a minute. Then slide off all the cookies still on the parchment paper right onto a wire drying rack. Take them off the parchment after another minute or so to cool individually. Let them cool completely before decorating. Store them in a covered container once cool to keep them from drying out. 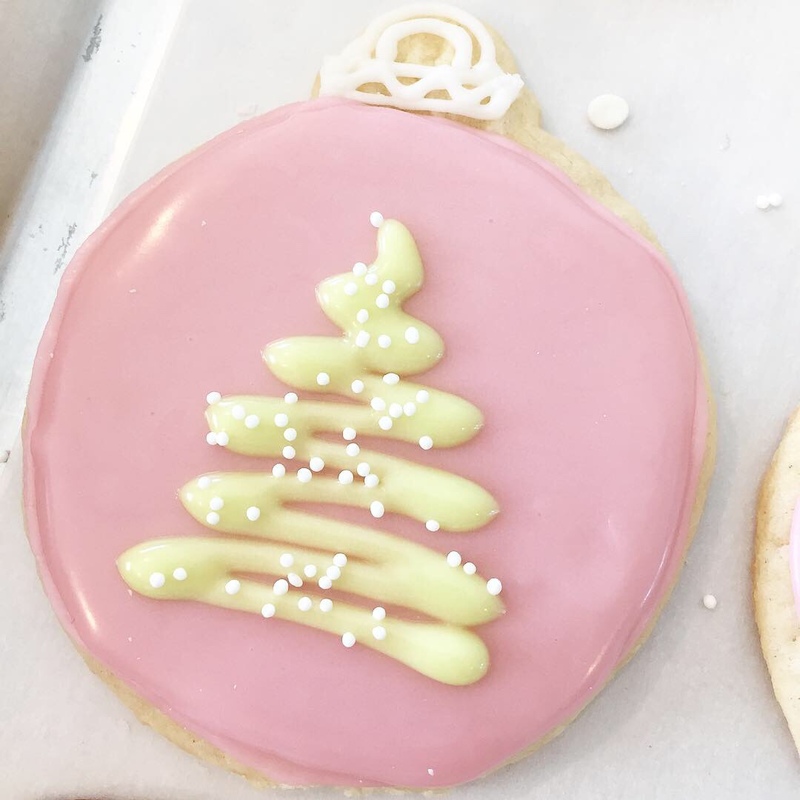 There are (at least) three different types of frosting used to decorate sugar cookies. Butter cream is the most kid friendly. It’s easy to spread on and top with sprinkles and you can throw them in a container and freeze them to take out and enjoy well into January when you’ve given up on your new-year-new-you diet. However, butter cream doesn’t harden well enough and doesn’t stack well. 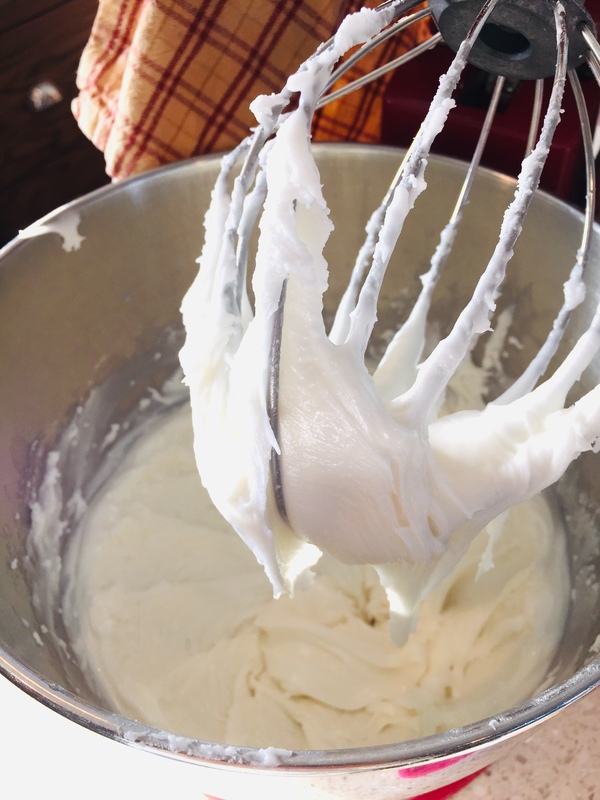 Then there’s royal frosting, usually made with meringue powder. This will give you a hard finish that will stack well and look professional. But some think it’s too hard. I prefer something in the middle. 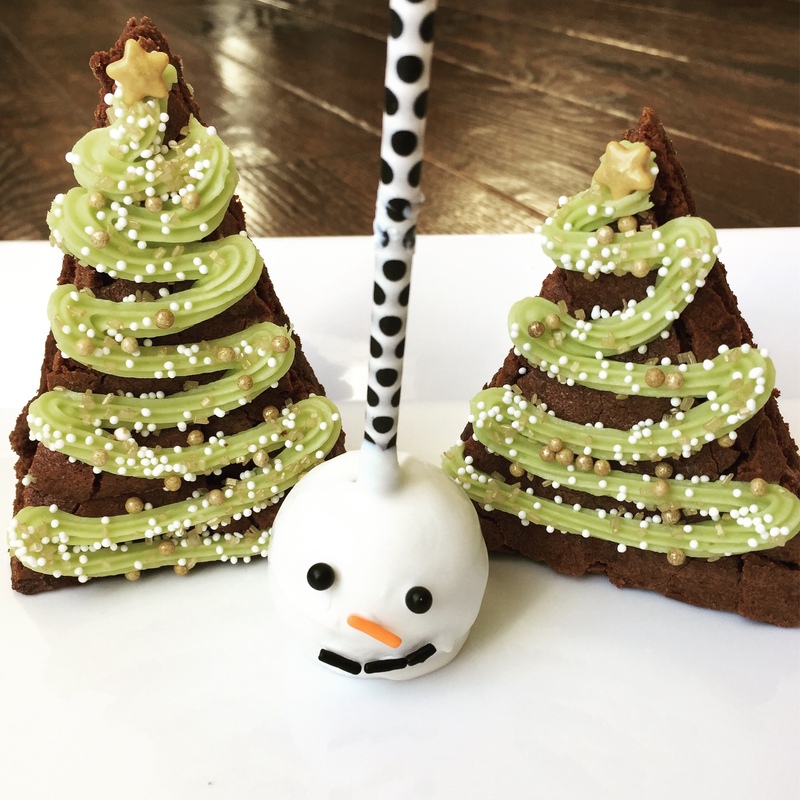 The frosting used in these pictures is made of powdered sugar, milk, corn syrup, and extract. It hardens after sitting out over night or up to 24 hours, but it maintains a soft center. It’s glossy and pretty but it’s a process and not terribly easy to work with. If you’re willing to try, here’s what I do. 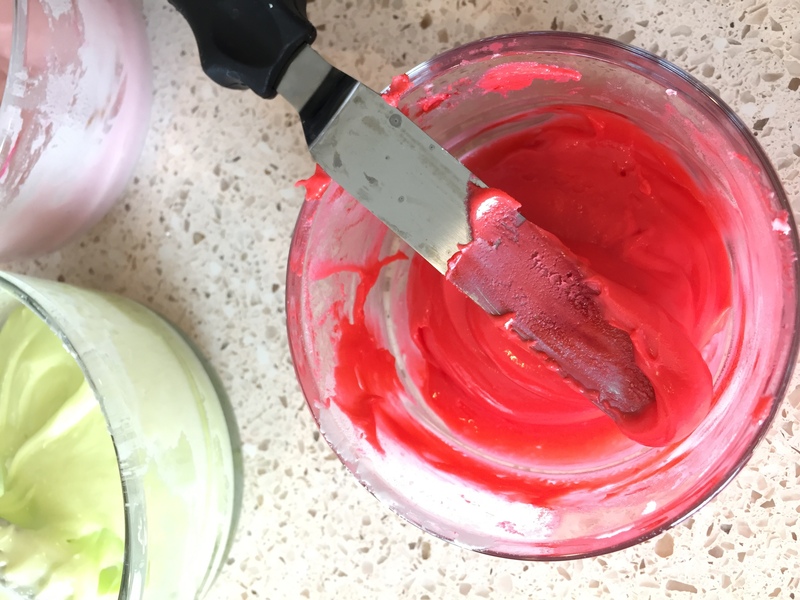 Separate it into smaller bowls to dye whatever color you want, using gel food coloring. 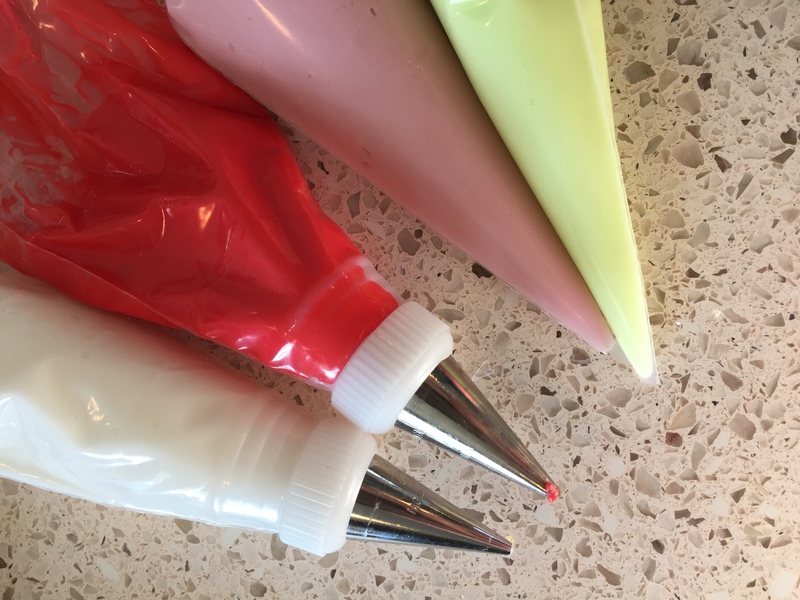 Fill pastry bags with about a third of the thick consistency frosting. Thin what’s left in the bowls with milk, adding a half a teaspoon at a time until you reach a consistency that will spread but not run. This may take some trial and error. If it gets too thin, sift some powdered sugar into it. Fill more pastry bags with the thin consistency frosting. Don’t clip the ends until you’re ready to pipe onto cookies so it doesn’t harden. 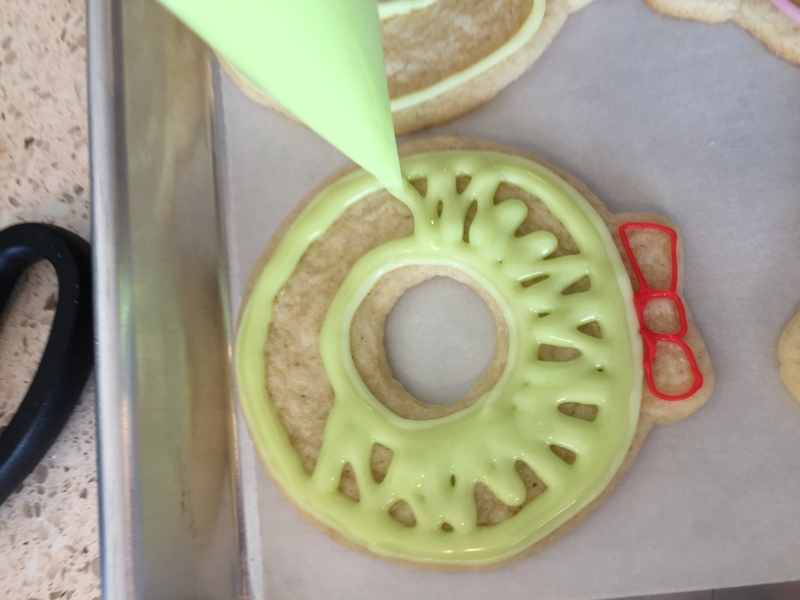 Work one cookie at a time, making an outline with the thick frosting then filling in with the thin. 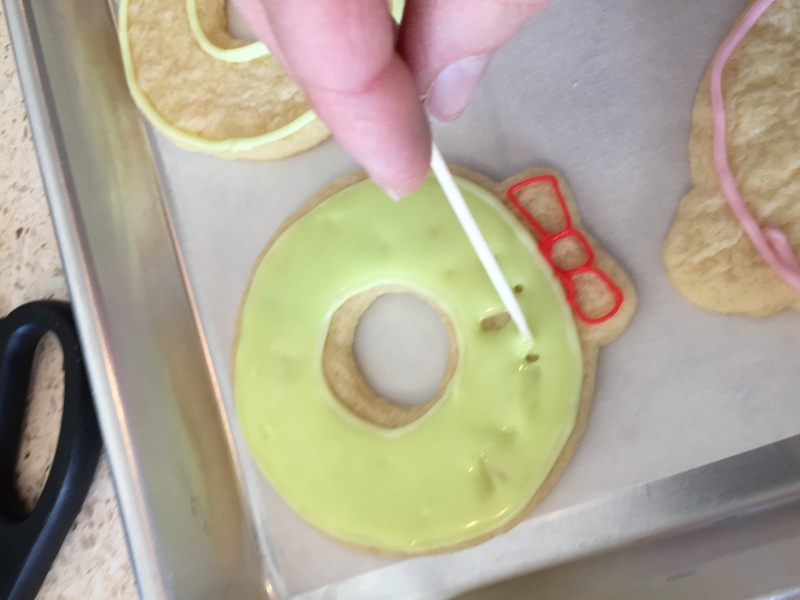 When frosting the outline, hold the tip of the pastry bag about an inch above the cookie and let it fall on its own to give a less wobbly line. When filling in, follow the outline first then zig zag inside. It should self-spread. 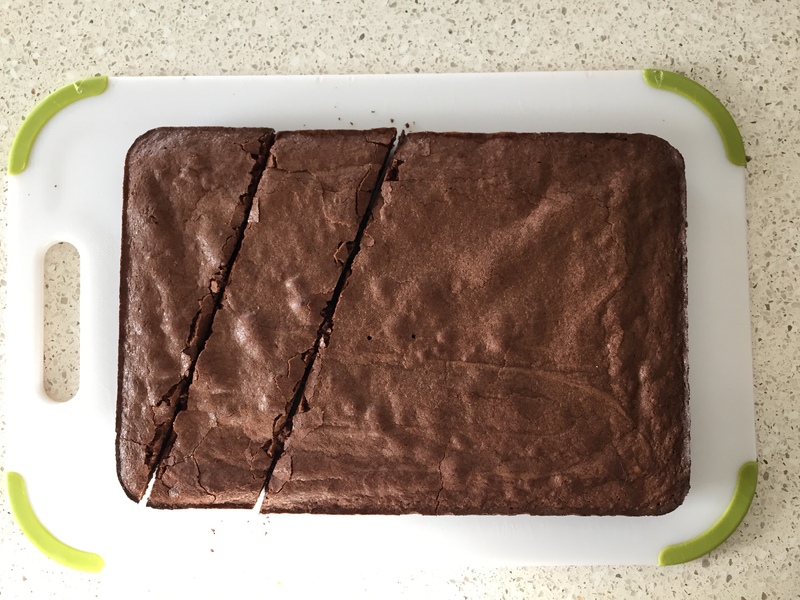 Where there are gaps, use a toothpick the connect the frosting around it and it will begin to self spread after. 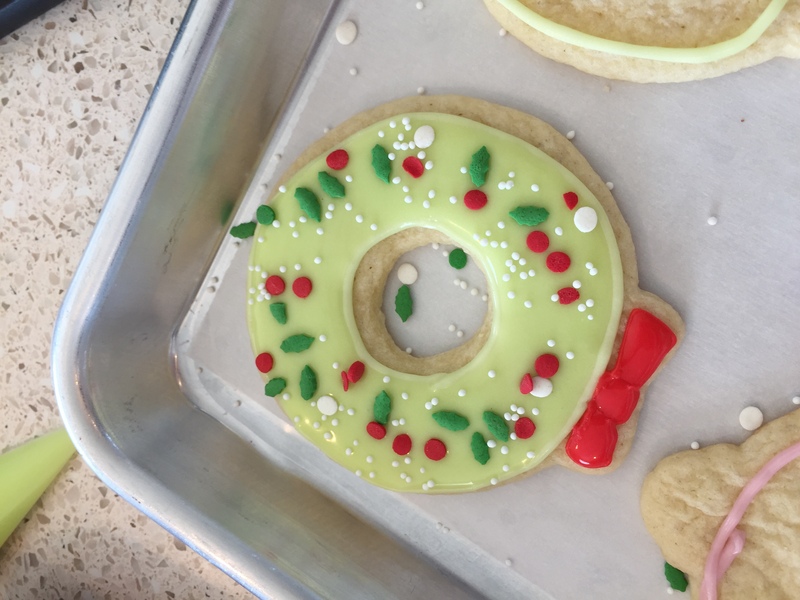 Do soft designs and add sprinkles while the frosting is still wet. 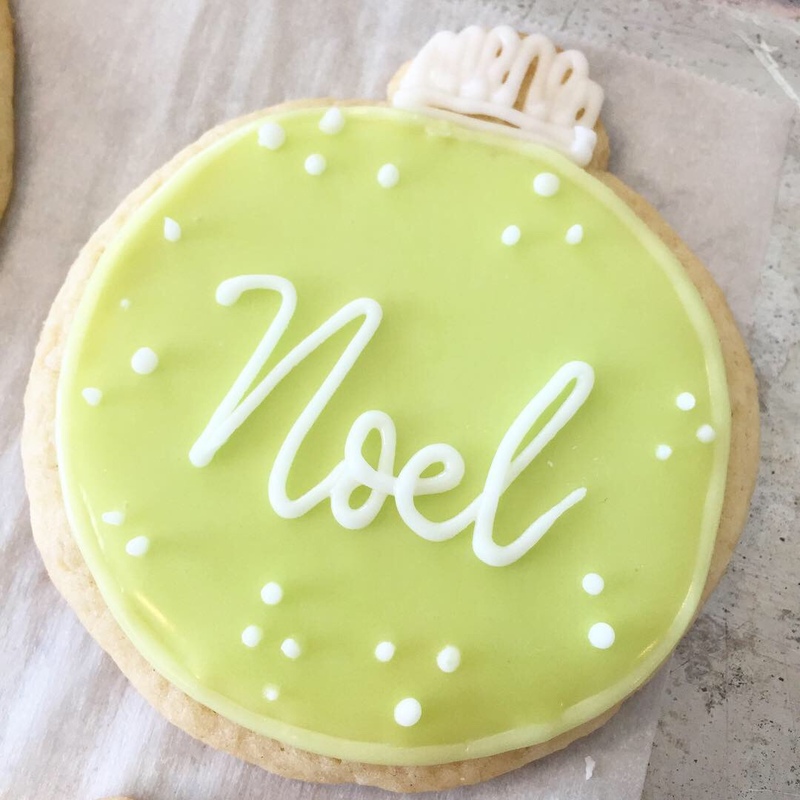 If you want more detailed designs, let the cookie harden over night, then add details the next day. While letting the cookies set, tent and cover with foil. You can refrigerate or leave at room temp. Just make sure the foil is well tented and doesn’t touch the tops of the cookies. Add the final details with thick frosting. Let it set again, if necessary. Stack and store in a sealed container. They are fine at room temp for up to a week. Then freeze. Note: These are the type of cookies I might make for a paying customer but ARE NOT the cookies I make with my kids. I give them some butter cream, a knife, and some sprinkles. Decorated sugar cookies can get your tinsel in a tangle if you let them. Don’t let them! Make them however suits your life and time, but be sure to make them with love that will lead to fond memories . Whether they are intricately decorated, or not, they still go down the same way!